Hello ... Hello ... my old friends ... It's great to see you once again! Joy Strachan-Brain and her legendary Midlands Celtic rock outfit Quill returned to the stage at The Prince Of Wales Theatre, Cannock last night [Friday 14th February] to thrill the assembled full house with a fantastic set which showcased not only their unique take on classic tracks by the likes of Fleetwood Mac, The Eagles, Thin Lizzy and Led Zeppelin but also a rich songbook of their own compositions. The evening commenced with Ben Cowcill and Amy Sharp making a welcome return in order to provide their much appreciated support for the evening, the highlights [for me] being Ben's version of The Beatles' "Blackbird" and Amy's rendition of "Skyfall" as they combined for their impressive encore. The much anticipated Quill set began with the atmospheric "Tumbling Years" and they then proceeded to enchant the enthralled audience with their superb interpretations of "Galway Girl", "Take It Easy", "Drops Of Jupiter", "Stairway To Heaven", "The Chain" and "Whiskey In The Jar" intermingling them with their own "Say It Ain't So" plus "Harvest" and "Going Home" from their excellent "Privileged" album. A Perfect World of Celtic tinged Music: Quill ..
Bev Bevan - who supported the band with his classy percussion skills - stated that Joy Strachan-Brain was the best female singer to have emerged from the Midlands - ever. And he was proved right as Joy produced a stunning vocal performance on the night to woo us appreciative onlookers. Her acoustic excellence was perfectly balanced by the violin virtuosity of Kate McWilliam - as her fiddling banter with guitarist Paul Sargent during "Duelling Banjos" proved. The attention to detail of Paul was thrilling especially as he and bassist Christian Noakes produced a note perfect recreation of that GP classic "The Chain". 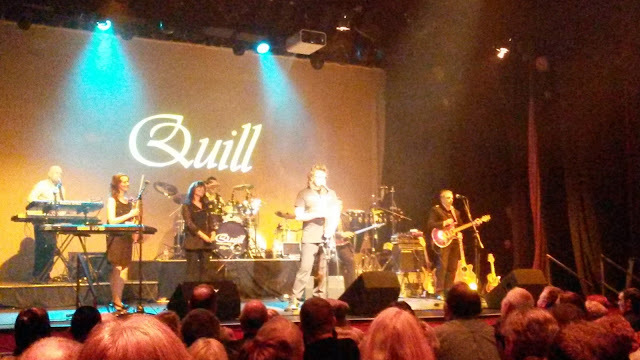 All of the Quill cast - not forgetting keyboardist/vocalist/guitarist Dave Bailey and drummer Tim Tandler - were on top form also as the Tamworth born band delivered their own vinyl classic "Say It Ain't So", the glorious "Celtic Experience" plus songs from their recent duo of EP's including the anthemic "England", the truly moving "Life Is Life" and their new live offering "Nine Mile Camp". 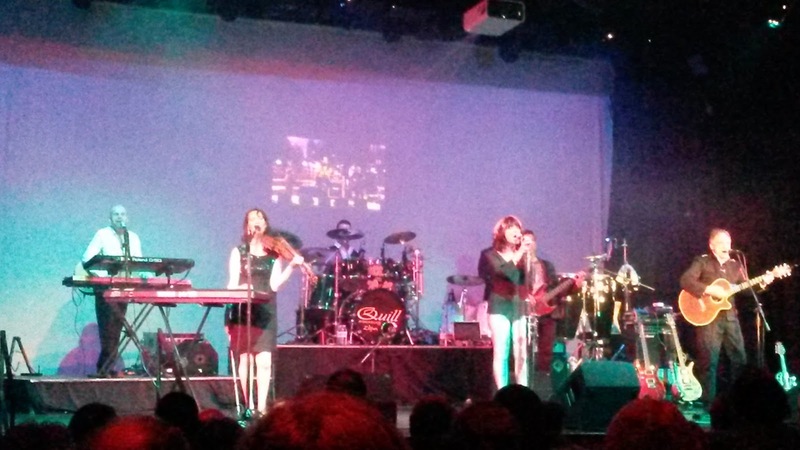 All in all, this was a top class concert by a band that is able to both celebrate its past whilst at the same time taking its many fans and admirers forward on their new musical sojourns. Go see 'em! 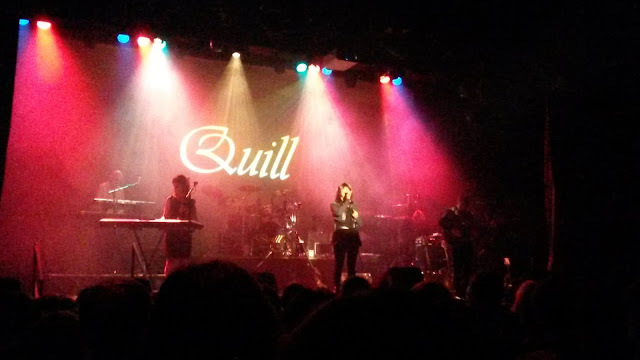 Quill were: Joy Strachan-Brain [Vocals/Percussion]; Paul Sargent [Guitar/Vocals]; Kate McWilliam [Violin/Vocals]; Dave Bailey [Keyboards/Guitar/Vocals]; Christian Nokes [Bass Guitar] and Tim Tandler [Drums] ... and occasionally Bev Bevan on percussion! ELO Beatles Forever [ELOBF] recommend Quill to those enlightened folks who enjoy the music of ELO, Jeff Lynne, Roy Wood, The Move, The Idle Race, 'Brum Beat', The Beatles and related artistes.